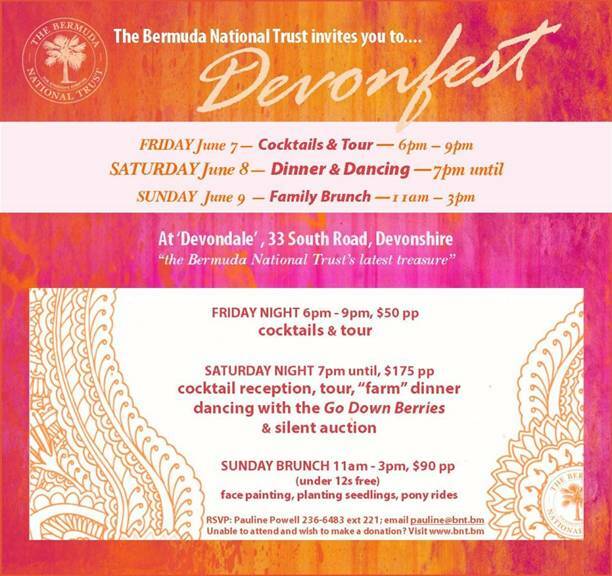 The Bermuda National Trust is offering residents a taste of farm life — quite literally — during its three-day “Devonfest” event being in June. The activities get underway on Friday, June 7 with a tour of the Trust’s Devondale property on South Shore Road in Devonshire and culminate with a family brunch at the farm on Sunday, June 9. The highlight of the festivities will be a dinner and dance on Saturday, June 8 which will include a cocktail reception, tour of the property, “farm” dinner dancing with the Go Down Berries and a silent auction.